This well-maintained detached villa has its own private pool area and a spacious plot size of 1200 m2. The generous living room and kitchen area directly connect to the south-facing terrace. 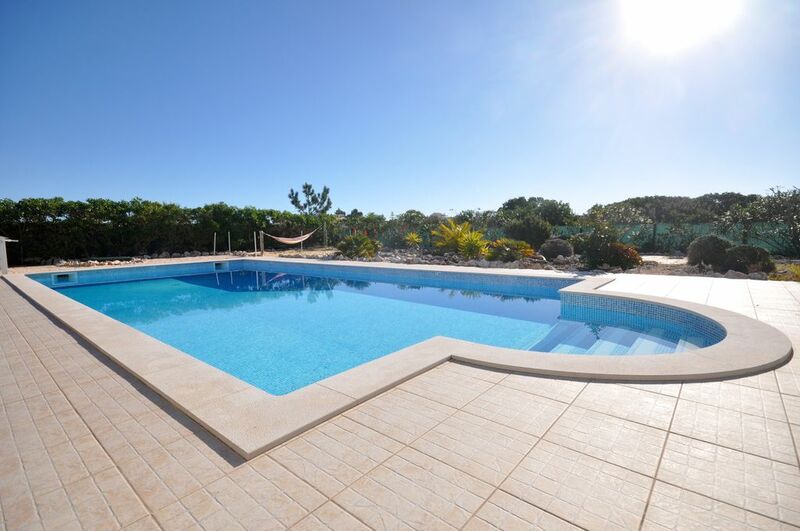 With the mild Algarve winter and year-round sun this is an ideal place to relax and sun-bathe. After a dip in the private pool (which measures 5x10 meters) you can enjoy a meal cooked on the solid barbecue. Children will love the play equipment in the garden which includes swings and a slide as well as a huge sand area with a hammock. The house is equipped for up to 6 people and has 3 sleeping rooms and 2 bathrooms. Two of the bedrooms have double beds (160 x 200 cm) and the third sleeping room contains two single beds (90 x 200 cm) which can be connected to form a double bed if needed. We have a baby cot and a high chair for our little guests. The house fulfills all the necessary official requirements and is registered as Alojamento Local. West Algarve: Unlike the South and East Algarve, the West is still untouched by intense tourism. The spectacular cliffs are up to 100 meters high and hide many stuning family-friendly beaches surrounded by fascinating rock formations. Small streams flow through many beaches, providing wonderful opportunities for young children to explore and play. Staying for a longer period provides you with the opportunity to make trips further afield. You can explore golf courses, marinas, shopping centres and aquaparks within one hour. The beautiful Andalusian city of Seville is only three hours drive away along the motorway. The Portuguese capital Lisbon is located three hours drive to the north and we would definitley recommend a visit to this historic and beautiful city. You can also connect your stay in Casa Sol with a city trip at the beginning or end of your stay and take advantage of the frequent flight offers to Seville and Lisbon airports. Driving directions: The nearest airport is Faro, which is around one hour drive from Casa Sol. Many major and low cost airlines fly to Faro. The description of Casa Sol is very accurate. The house is clean and spacious. Everything new, simple and with good taste. We have intentions to return to the house soon! You can tell the Villa was recently built. The grass is still waiting to be sown, the pool shower was assembled during our stay and the swing's structure was waiting for more permissive guests... regardless, the Villa is almost perfect, and I'm sure next year it will be. The living room includes the kitchen and the dinning area, it works like an open living space. Everything was new and of good quality (a big thank you to Mr. Ikea), including cutlery and pots and pans. It has a great terrace, with a perfectly positioned barbecue. We had timeless dinners there, where we ate the fresh fish bought at the Aljezur Market. The pool is really good, the sun shines upon it from early morning till almost dawn, since the terrace faces north. The owner warned us it might be windy, but I guess we got lucky, it was perfect every day! The Villa is close to Monte Clérigo's beach, approximately 5m drive, but there several other paradisiac beaches just 15 to 30m away. The owner was nice enough to provide for a couple of bycicles and some stuff for the pool, the latter were greatly appreciated, although since the bikes were recently purchased they were impossible to use (the tires were down and the pedals were still facing in)... maybe next year! By the end of our stay all could say was that we want to be back next year! Cette jolie villa très agréable nous a permis de passer de très bonnes vacances. Le quartier était très calme, et la maison grande et bien équipée, d'une propreté irréprochable. Nos hôtes, charmants, ont parfaitement répondu à nos attentes. We had a nice week, despite the cold weather and the rain (which was good for the Portugese people, because there hadn't been rain since january. The house was comfortable and warm, but we couldn't use the pool because of the weather (which is obvious in february). Also, the garden was very windy. Location of the house is nice, close to 2 beautiful beaches: Arrifana en Mte Clerigo. Nice sleeping rooms and bathrooms and a kitchen with all the supplies. We stayed with 4 but the house can easily accomodate 6 people. Tolles Haus, nette Vermieter, was will man mehr? Sehr schönes, gut gepflegtes Haus, das keine Wünsche offen lässt. Die Vermieter haben uns sehr nett empfangen, das Haus erklärt und einen kleinen "Willkommensdrink" bereitgestellt....sehr nett. Das Haus ist schön und sehr praktisch eingerichtet und mit allem - wirklich mit allem - ausgestattet. Küchenartikel, Waschmaschine, Entertainment, WLAN (für unseren 16jährigen Sohn lebensnotwendig), alles in guter Qualiät vorhanden. Mehrere Strände in der Umgebung, gute Einkaufsmöglichkeiten, trotz Hochsaison kein zu hoher Gästeandrang an den Stränden und Lokalen. Vale da Telha is located in the beatutiful Costa Vicentina Nature Park in the West Algarve. Far away from areas of intense tourism, this region offers stunning beaches, spectacular scenery and the chance to get closer to nature. Near the house are many places of interest and superb, sandy beaches including Arrifana, Monte Clérigo and Amoreira. The freshwater lake in Vale da Telha is home to lots of wildlife and birds, making it the perfect spot for nature lovers to explore. As well as a supermarket you will find a variety of restaurants in Vale da Telha providing lots of opportunities to eat out and enjoy typical Portuguese cuisine. The picturesque, historic town of Aljezur is 7 km away and has everything you need for your holiday. We recommend a visit to the typical Portuguese market hall with fresh fish and vegetables. There is also an emergency medical service in the town. Bei Buchungen von über 3 Wochen machen wir Ihnen gern ein individuelles Angebot. Die Preise enthalten alle Kosten wie: Heizung, Klima, Gas, Wasser, Strom, wöchentlicher Poolservice, wöchentlicher Handtuchwechsel, 2 wöchentlicher Bettwäschewechsel und professionelle Hausbetreuung vor Ort. Check In ab 16 Uhr und Check Out bis 10 Uhr Heizung / Klima: Das Haus verfügt über moderne Klima- / Heiztechnik, die Ihnen jederzeit angenehme Temperaturen garantiert ! Es gibt bei der Miete von Casa Sol keinerlei versteckte oder zusätzliche Kosten oder Gebühren ! Außerhalb der Hauptsaison ist die Anreise und Abreise an einem beliebigen Wochentag möglich.